Our love of musicals is so great it spilled over into a second act, and that’s with the pared down version. (It’s not a problem: It’s just a challenge — it’s a challenge! — to resist…putting every song we love on this list.) We pick up after intermission with two Southern gals relocating to New York City. One comes for grad school, the other seeks a job, both discover the beauty of rush tickets, and each continues to deepen her love for musical theatre with the help of these shows. Scout: I was maybe thirteen or fourteen when my aunt gave me a burned copy of the Last Five Years original cast album. It was sometime after I had seen Dirty Rotten Scoundrels, and I was looking for more Norbert Leo Butz and Sherie Rene Scott. I’ve never fallen in love with a show so quickly, and though I had never really felt the emotions or been in the situations they described, there was something so beautiful and universal about the music. I got tickets to the 2013 off-Broadway revival as soon as I knew it was happening. Zelda: My all-time favorite (off-Broadway) musical! I’d like to think I can count this one too, since I saw the movie version in New York? All I want in life is a Broadway run, or at least another off-Broadway production, so I can see it in person. Zelda: I am still upset I missed this show. Tragically, I discovered Chuck, and the wonderfulness that is Zachary Levi, a couple months too late. But that hasn’t stopped me from listening to the cast recording, especially this song, on repeat! Zelda: My second day in New York, Scout took me to see this show as a “welcome to the big city, don’t freak out, it’s going to be fun” outing. And even though Billy Porter was off that day and I could only really see half the stage from our lottery seats, it was perfect. The music lifted our souls, cookies from Schmackery’s brought our taste buds to orgasmic heights, and my first ever New York celebrity sighting (Doctor Who’s Arthur Darvill, on his way to his own Broadway gig) made it a fitting start to my life in New York, which at the time still felt more like an extended vacation than a reality. Scout: I loved this musical so much I saw it three times. The perfect feel-good musical, with its Cyndi Lauper score and great message about being yourself, it’s just what I need on a bad day. Scout: This musical was easier to see on its national tour than in New York, even after being open for 4+ years, and on the humor scale it absolutely lives up to the hype. My mother and I laughed so hard we cried. Every song in the show is equally ridiculous and hilarious; other favorite tracks include I Believe, You and Me (But Mostly Me), and Baptize Me. Zelda: I saw the national tour of this show when it came through Louisville last year, fortuitously timed on the same weekend as my brother’s high school graduation. It was particularly lucky because, as Scout said, getting tickets for the New York production is nigh impossible, and horrifically expensive. Zelda: Thanks to Scout’s tenacity (and her momma’s birthday generosity), we were early adopters of this show, seeing it in its first week of real performances. Highlights included the old lady in front of us complaining loudly that she didn’t get the interpretive dance by the human campfire (we feel you) and meeting the incredibly kind and talented Norbert Leo at the stage door. Scout: As a rule, I will see anything starring Norbert Leo Butz. Add a surrealist journey through the South, and a score by Andrew Lippa? Yes, please. Despite the fact that our theater neighbors didn’t appreciate it as much as we did, I couldn’t think of a better way to spend my birthday. Zelda: As we have established, special occasions in our lives call for Broadway, and Matilda was how we celebrated my 24th birthday. Because nothing says semi-fledged adult like giant wigs and singing children? While The BFG was always my favorite Roald Dahl tale, Matilda — a bookworm like me — ran a close second. Also this show made me want a Razor scooter for the first time since the 4th grade. Scout: Another show I saw multiple times, if only for the hilarious Leslie Margherita‘s portrayal of Mrs. Wormwood and Tim Minchin‘s rocking score. Zelda: In the history of our friendship, there is one debate that continues to divide me and Scout, a tentative “agree to disagree” truce holding the fragile peace together. The question? Favorite Broadway musical. Scout is a Sondheim devotee, and her vote goes to Assassins. But I am firmly in the camp of Les Miz. I mean, it has everything: drama, romance, comedy, tears, France, sassy children, Colm Wilkinson’s facial expressions. This revival was actually the second time we saw the show together, the first being a West End production in 2011 while we were studying abroad (from which several cast members would go on to star in the Oscar-nominated film version, making us feel like worldly little theatre hipsters). Zelda: Rush tickets are a beautiful thing, y’all. And there are few things that make us appreciate New York more than a spontaneous Thursday night trip to Midtown and a few hushed hours in a velvet seat. This one was in honor of my brother (a fellow theatre lover) visiting, but really, we do not need an occasion. Zelda: After years and years of admiration, I finally got to see the luminescent Sutton Foster perform live! This show, with its Appalachia-tinged tunes, struck a chord in our hearts, and special thanks go to Scout’s momma for again making our Broadway dreams come true. Also, we got to play with Sutton’s dog at the stage door, because every evening should end with puppy snuggles. Scout: I love the Southern road narrative, and I love the music of the Appalachian mountains, and I love Sutton Foster. Basically, Violet has everything I want in my entertainment — the perfect way to spend a warm city night. Zelda: My dad loves Carole King, so I’ve always been vaguely aware of her as that person he likes or the woman who shows up on Gilmore Girls. But it wasn’t until this show that I understood just how amazingly talented and prolific she, and her ex-husband, were. I saw this show with my dad, the Carole lover, and my sister, who wanted to see The Lion King instead, and by curtain call all three of us were completely won over. Beautiful sparked my own love affair with Carole, and in many ways her songs have become the soundtrack to my life in New York. When I’m down and troubled, when I find it impossible to get up one morning with a smile on my face (never mind every single one), Carole is there to pick me up. Scout: Carole King is amazing. 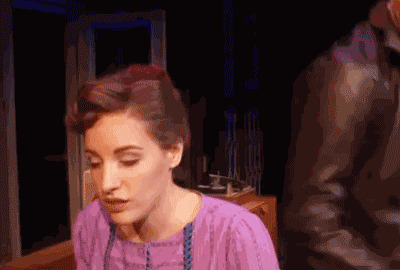 Jessie Mueller is amazing. Friendship is magic. We are all as beautiful as we feel.